‘Tis the law of nature that on the hottest day of the year, your air conditioner goes kaput. Every year of my childhood in Phoenix, like clockwork, our central air unit would shut down and we would have to re-locate to a hotel for a night while we waited for an under-slept, over-worked repair man to take a look. We (Boyfriend, Cat, myself) did not decamp for the night (or two) that the air conditioner was broken. Instead we pulled out all the fans in the house, made DELICIOUS frozen strawberry daiquiris (don’t judge, it was for survival), made excuses to go to air-conditioned places and flat-out refused to turn on the stove. The latter worked out quite well for me, as it gave me an excuse to expand on an old favorite in my recipe book, a raw green bean salad. I originally came upon this recipe 3 years ago while walking around the Union Square Green Market. 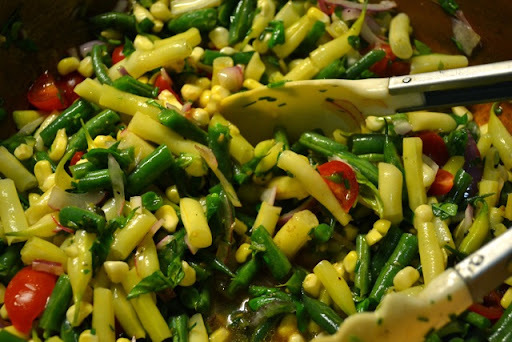 The summer green beans had just come to market and the staff manning the Green Market booth had made samples of this refreshing salad. One bite of the crisp green beans mixed with a vinegar-laced dressing and the sweet yet pungent paper-thin red onion slices and you’ll swear you are eating the essence of summer itself. Enjoy! *Confession: This isn’t exactly no cook. However, all you have to do is boil water and turn it off. The residual heat in the water cooks the green beans and corn perfectly while you are finishing up the salad. You can stay as far away from the stove as you like. Makes 8 servings as an appetizer, 4 as an entrée. Prep time: 15 minutes. Total time: 15 minutes. Bring a medium pot of water to boil while preparing the green beans and corn. 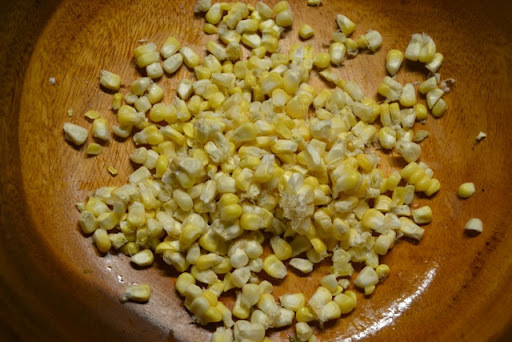 Turn off water and add green beans and corn to water, allowing them to steep for five minutes. Meanwhile, slice red onions and quarter the tomatoes. Add to a large salad bowl, along with oil, vinegar, and herbs. Toss to combine. Empty green beans and corn into a colander and rinse with cold water. Drain well, then add to the salad. Toss well, adjust salt and pepper, and set aside until ready to serve. Right before serving, toss in the croutons and season again, if necessary.